The Food and Drug Administration issued its final guidance for an Obamacare regulation mandating calorie labeling in restaurants, which includes a 171-word definition of "menu," and will apply to coupons and advertisements. The document, which intends to clarify how food establishments should comply with the regulation, is doing little to ease the concerns of pizza chains that have said it is "impossible to comply" with the rule. The final guidance includes a 96-word definition of "combination meal" and a 163-word definition of "restaurant-type food." The government also goes into when "Aunt Cora’s French toast breakfast" must have its calories listed and tells restaurants not to use plus or minus signs on their menus because they are too "confusing" to Americans. But drawing the biggest criticism is the government’s definition of menu and strict rules for calorie labeling of toppings. The government considers a menu to be the "primary writing of the covered establishment from which a customer makes an order selection, including, but not limited to, breakfast, lunch and dinner menus; dessert menus; beverage menus, children’s menus, other specialty menus (such as catering), electronic menus, and menus on the Internet." The full definition is 171 words. Merriam-Webster has a 12-word definition for menu. The phrase "from which a customer makes an order selection" opened the door for coupons and advertisements to be included in the mandate. The FDA said calories must be listed on coupons if they have the restaurant’s phone number, and advertisements can be "considered a menu." "[A]dvertising or marketing material (including coupons) generally would not be considered menus or menu boards," the FDA said. "However, in the example of a pizza coupon that includes a phone number or web address where the customer can place an order and that states ‘1 large pepperoni and sausage pizza $9.99,’ the ‘coupon’ can be used by a consumer to make an order selection at the time a consumer is viewing the coupon (i.e., the coupon includes the name of the standard menu item, price of the standard menu item and a phone number, or web address where an order can be placed)." "Therefore, in this situation, the coupon would be considered a menu (and not simply a coupon) and would be required to include a calorie declaration for the listed standard menu item," the FDA said. The rule also requires restaurants to post calories for every topping offered at pizza or ice cream chains. The American Pizza Community, an association of pizza chains including Domino’s, Papa Johns, Little Caesars, and Pizza Hut, blasted the FDA for not making the calorie labeling rule easier to comply with. "FDA’s final guidance on the menu-labeling rule confirms our worst fear: it remains as problematic today as it was at its inception," the group said in a statement. "Despite [The American Pizza Community’s] continued attempts to address concerns with the rule and provide clarity and sensible changes that take into account modern technology, FDA’s final guidance shows that it will continue to push for one-size-fits-all regulations that do little to enhance customer knowledge and create an undue burden on the backs of small business owners." The organization is continuing to call on Congress to pass the Common Sense Nutrition Disclosure Act, sponsored by House Republican Conference Chairman Cathy McMorris Rodgers (R., Wash.). 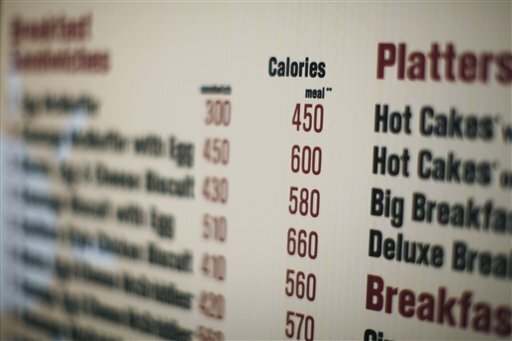 The bill would give businesses greater flexibility in how to display calorie information, such as allowing large pizza chains to post their calorie information online. The legislation also clarifies that advertisements, coupons, flyers, window displays, and posts on social media are not menus. "FDA has had six years to implement this rule and still can’t get it right," the American Pizza Community said. The group added that the legislation would "provide our customers with important information, but in a way that is actually useful to them, accurate, and takes into account the business model of small business pizza delivery restaurants." The regulation goes into effect in December 2016 for restaurants, groceries, cafeterias, movie theaters, amusement parks, mall cookie counters, coffee shops, and other food establishments with 20 or more stores.